Novelty items don't have to be useless, fit only for the junk bin or a corner of the garage. At Promotion Pros, we believe that novel and useful can go hand in hand, which is why we've developed a wide range of novelty pen offerings. 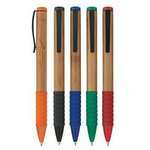 The Bamboo Pen is an attractive pen having a natural barrel with black, blue, green, red or orange trim. 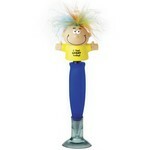 It is a twist action pen, with a comfortable rubberized grip making writing comfortable; as it gives a steady grip. Our Eclaire Illuminated features twist rubber grip for comfortable writing, Customizable with your logo for Brand Recognition. Pens are a practical and useful gift for all occasions and industries. They are easy to accommodate and extremely affordable. With the beautiful colors of our planet adorning its head, the Earth Pen makes a good first impression of your brand, on a limited budget. 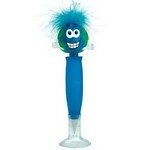 It is a non-retracting ball point pen having a fun earth head design. 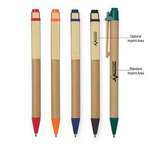 The Eco- Inspired Pen has a paper barrel, with a wooden clip, making it ecofriendly. It is available with black ink and a medium point. 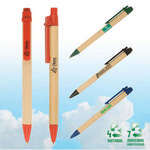 This quirky Eco Green Paper Barrel Pen is the perfect give away as souvenirs. It is fun and colorful available in natural color with different color trims namely blue, black, red and green. Whether it is doodling in a journal or penning the next bestseller, the Feel Great Talking Pen is a fun and inexpensive way to promote your brand across several industries. 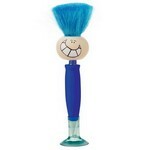 It is a non-retracting ball point pen having a pleasant cartoon head design. 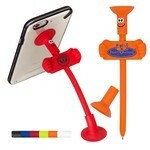 The goofy bendy pen with phone stand is a unique silicone pen that features a cell phone holder. The Airplane Lear Jet Bent Pen is a full size ballpoint pen with a breathe-through safety cap. Our Alligator Bent Pen is a full size ballpoint pen with a breathe-through safety cap. This Awareness Ribbon Bent Pen is a full size ballpoint pen with a breathe-through safety cap. The Cat Bent Pen is a full size ballpoint pen with a breathe-through safety cap.